In Colorado, many consider the Elephant Rock Cycling Festival a marker that the cycling event season has begun, but in 2015, there are 28 earlier events listed on the Pedal Dancer® event ride list calendar. Elephant Rock, or E-Rock as it is known by it's nickname, is no longer the season-starter yet the ride remains a long tradition. So popular is the ride (with a rider cap of 4500 for the metric and full century routes) that many "E-Rock Alternative" rides have popped up in the area. Rides organized by those who dislike this large organized event ride for some (strong) reason or another. Two years ago I joined onto one of those E-Rock alternative rides (because they promised a party afterwards) - it turned out to be a hundred miles on uninspiring inner city seamed bike paths through the ugliest industrial landscape imaginable. I renamed the ride the Bataan Death March of Bikes Rides and swore I would NEVER do that again. I could have been out riding the rollers of the Black Forrest! The Elephant Rock Festival is centered in Castle Rock, Colorado, almost half way between Denver and Colorado Springs. It is an early morning start with departure times of 5:30-7:00am for the century. The only two reasons that will get me up at 4:00am are a flight to Europe or a century ride. This ride is worth the early start; E-Rock has a history of rough weather with rain, wind, hail or sleet. Typically the 6-hour century rider in Colorado can expect cold starts and warm finishes. The immediate reward for finishing this event is a nice social gathering post race on the county fairgrounds grass lawn with a mediocre (better than expected) lunch. The true reward is that wonderful post century body buzz and feeling of accomplishment. The signature Event Jersey - some people collect these at $76 a pop. To cut right to the matter of things, the two main positives of this ride are: good value (as long as you don't buy that jersey above which is more than the cost of registration) and a route which covers territory typically not possible to ride unassisted. Value and access matter to me. I don't like paying high prices ($125-155 for Copper Triangle, compared to $70-85 for E-Rock) for an event ride I could do any given weekend on my own by utilizing local markets or gas stations to fill my water bottles (although I do believe $150 for the Triple Bypass is a fine deal). 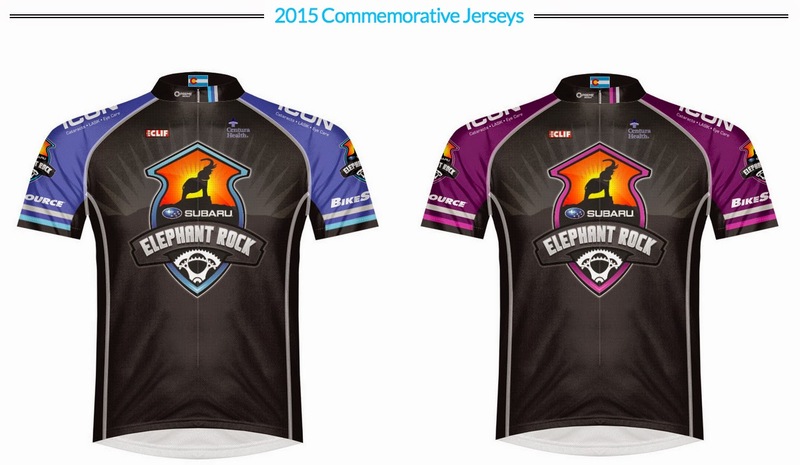 If you register by February 28th, Elephant Rock is $70 (with a $4.90 registration fee). The amount goes up slightly by increments prior to the ride. Register here. I enjoy the rolling terrain of the Black Forest included in the Elephant Rock Century. I also remember courteous enthusiastic riders with a pleasant overall feel to the event (except for the local farmers splashing the road with cow dung). The century and metric century routes take cyclists along roads not possible to ride contiguously without aid stations or sag support. New this year, is a brand new course utilizing farm roads previously unpaved or unconnected. The route should be a nice change and the event is on my personal calendar. Elephant Rock new route course for 2015. Ride With GPS interactive course map. Castle Rock is 35 minutes south of Denver, along the Front Range of Colorado. The best part of attempting a century ride in early June is that it gets me out riding in March, April and May! Elephant Rock is a moderate century with climbing limited to 5705 feet over the distance. A good preparation for the big climbing routes later in the season which tend to be greater than 10,000+ feet of climbing in the same distance. Did you know there are 32 century rides listed on the Pedal Dancer 2015 Colorado Cycling Events and Bike Rides calendar list. Pick up your registration packet prior to ride day. Set out all your gear ahead of time, the night before, and pack your bags. Pack one bag with all the items to put on pre-ride or put in your jersey pockets (when the bag is empty on ride morning you know you have everything you need). Pack a second bag with your after ride clothing. Pack all your ride food the night before. I place extra drink mix measured into a small plastic bag to bring with me in my jersey pocket, accounting for a bottle every 45-minutes of my estimated ride time. I cut up bars into pieces and place them in a baggie for my jersey pocket. Know your drink mix calorie and food calorie needs. A replacement mix that is fine for 45 miles, might need more supplemental food for 100 miles of continuous effort. Remember to bring a bike pump in your car. I've seen people getting flats pre-ride by rolling over parking lot crap. I always pump my tires prior to every ride. Absolutely wear a three pocket jersey, you will need it for your extra clothing layers and food. Eat your regular pre-ride breakfast. Wear arm and knee warmers and a vest (or light jacket depending on the weather forecast). On the ride, within 30-45 minutes, begin eating small amounts at regular intervals. I reach into that baggie of bar cubes open in my back pocket and pop one into my mouth while riding. I do not only eat at rest stops. Consider passing by the first rest station, if possible. It is typically the most crowded and will take up the most of your time. Don't eat any food or drink any mix you are not accustomed to fueling your ride. Don't try out any new gear on ride day. I admit I typically only ride with one bottle full of water (but carry two bottles in case). The rest stops are so frequent you do not need two full bottles every ~14 miles, unless you ride 8mph. It adds weight and is simply more fuss than necessary. Some people skip aid stations all together, I like to stop as the ride progresses simply to mark the distance traveled and enjoy the mood of the event, but I strongly recommend not stopping for long (!!) at each rest stop, keep moving! 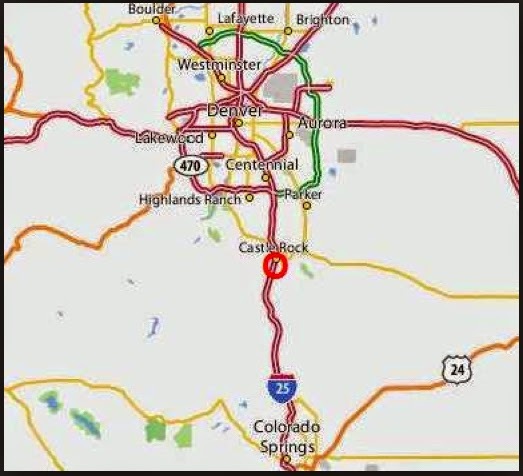 Weather moves in during the afternoons in Colorado. Ride safely, and stay out of the big pelotons that pass in mass unless you know all of the riders in them, or have been asked to join in. Ride consistently and finish strong. Keep your heart and nerves as steady as possible to conserve energy. It is much more fun to race the last 12 miles than it is to suffer the last 12 miles. Bring clothes to change into immediately after the ride, before lunch. Change in your car. Bring a jacket in case it is cold, bring shorts/skirt in case it is warm. Go back to the finish line to cheer on your friends as they finish, well after your time! Don't hesitate to ride a century on your own, you will never truly be riding alone. My bet is that you might finish with some of the same people you started with. One year on the Elephant Rock (I think I have done it 6 or 7 times), I was riding with a good friend, who proclaimed, at mile marker 33, that she was not feeling the love that day. Although we had planned to complete the century ride, we diverged at the cut-off to the 65-mile route. I decided to go with her. Suddenly both of our moods lifted and we glided over those last remaining miles. I also experienced the elation of removing the paper wrapping off the porta pottie toilet paper rolls - I gotta say there is something to be said for arriving at rest stations first (and I think that is better goal than any STRAVA record). I never had a better, more fun ride. I learned spontaneity is just fine, even on a planned event ride. View of 14,114 foot Pikes Peak from the route of the Elephant Rock Century ride. 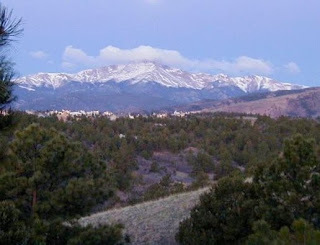 Photo by Karen Rakestraw while riding the event in 2010.The morning light from a bike saddle is fantastic in Colorado.